NRDC’s Noah Garcia describes the latest utility research on how electric vehicles affect the electric grid — and it’s good news. That’s a brief summary of what Southern California Edison and a growing number of U.S. electric utilities are aiming for to decarbonize the power and transportation sectors in a mighty one-two punch. Some may worry that charging hundreds of thousands — and then millions — of electric vehicles (EVs) will spell trouble for electric grid maintenance and reliability. However, a new analysis of real world data from California brings good news: EVs are not crashing the grid. Since 2012, California regulators have required the state’s three investor-owned utilities—which serve three-quarters of the state’s electric demand — to file reports that primarily look at how EVs affect the local grid and drivers’ charging behavior. With 350,000 vehicles that are often clustered in certain neighborhoods, California’s experience managing EVs and the grid should be a welcomed postcard from the future for all states experiencing EV growth. Time-of-use (TOU) rates are simple and useful tools for shifting EV charging load to periods that are beneficial for the grid. 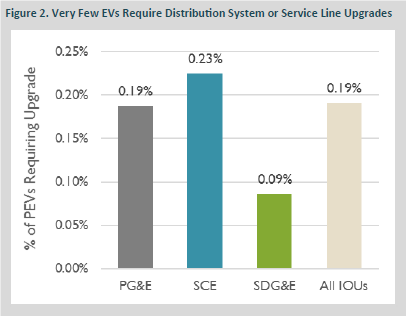 First, despite fears that EVs would overwhelm the existing electric grid infrastructure, only a very minor fraction of them—0.19 percent—have actually necessitated distribution system or service line upgrades. Moreover, this data point has translated to relatively low levels of EV-related spending on grid maintenance: of the $5 billion the utilities spend annually to maintain the distribution system, roughly $610,000 was attributable to the need to upgrade it to accommodate EVs. That’s about 100th of 1 percent. Each of the utilities in the report offers time-of-use (TOU) rates to their residential customers, and these TOU rates vary predictably depending on when the energy is used. For example, a kilowatt-hour used at midnight may be twice as cheap as one used at 4 p.m.
We now know in theory and in practice that these rates are more effective than conventional residential rates at incentivizing charging when its most beneficial to the entire electric system: the figures below convey the message that EV drivers on TOU rates do more charging off-peak and contribute to costly distribution system peaks much less often than drivers on flat rates. For context, a distribution peak is generally the period when electricity demand is greatest on the grid over the course of a day, month, or year. The greater the peak, the more expensive grid infrastructure and electric generation needed to meet the demand if left unchecked. “Residential” describes customers that are on flat, non-TOU rates. 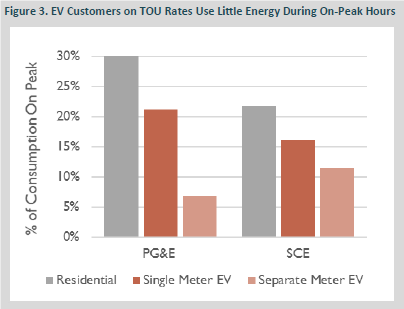 “Single Meter” describes customers that have one meter for all home electric usage on a TOU rate. 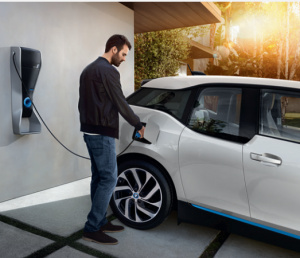 “Separate Meter” describes customers with a meter dedicated solely to TOU EV charging. The data also reveal that the length of the off-peak periods affect the diversity of EV peaks: the greater the window of time to take advantage of low-cost electricity, the greater diversity in individual EV demand. That’s a good thing. Think about a brick and mortar department store planning its sales strategy for the holiday rush. If the store is offering a discount on all items for only 24 hours, you might expect that store to be much more crowded and chaotic during that period than if it extended the sale for a week and allowed customers more flexibility to come in at different times. The same principle holds true for EV charging. Generally, the greater the off-peak window (sale period), the less likely individual peaks (customers) will negatively affect system reliability (overcrowd the store so as to reduce the level of service). And with the “smarts” embedded in most EVs today, it’s easy to “set and forget”: drivers can program when they want their EV to charge and take advantage of the lower off-peak pricing available through TOU rates. In short, California brings welcome news for all states experiencing and accelerating EV growth. Rather than crashing the grid, grid impacts from EVs to date in the country’s largest market have been marginal. Moreover, TOU rates are transparent, effective tools for contributing to grid reliability and flexibility while driving greater fuel cost savings for EV drivers. Therefore, states, utilities, and grid planners need not fear transportation electrification; they should embrace it. Noah Garcia is transportation policy analyst, Midwest and energy & transportation programs, for the Natural Resources Defense Council (NRDC). This blog originated on NRDC’s Expert Blog and was reposted with permission. 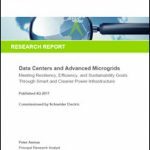 No Microgrids at the Busiest Airport in the World? Hi bro, thanks you share the post. Electric auto proprietors will be paid for giving a vitality a chance to organization utilize their vehicle’s battery in a spearheading plan to build take-up of the cleaner vehicles and help control networks deal with the development in environmentally friendly power vitality.